may I ask if the 1k lease cash is nationwide? Apparently, my dealer is having a 750 dealer flex cash and a 500 rebate if we have a 2006 or newer Acura, Subaru, bmw etc vehicle in our household. does that mean I can add the 1k to my 750 and 500 rebate? Please let me know as I'm signing the car soon. Thanks so much for the help! So far as I know, the Acura information we have is nationwide. That doesn't mean there couldn't be regional or local incentives on top of that. Ill report back with the deal if all goes well. The lease cash for Acura is a dealer incentive. They might not (and don't have to) disclose it. May i ask what this month's mf, rv, lease cash is for the 2016 base tlx v6? Term is 36/12k, location is California. it seems like the v6 gets a greater discount (selling price) than the 4cyl based on this thread and the 2015 thread. .00070 and 58%. $1000 lease cash. The V6 is more expensive to start with, so bigger discounts are expected. May I get the MF, RV and lease cash for the 2016 TLX V6 SH-AWD Technology Package please? 36 month/12K miles in Alabama. Thanks in advance! 56% and .00070. $2000 lease cash. Hello! I am returning my 3rd TL lease to the same dealership for a new 2016 TLX SHAWD w/ Advance pkg. Do I try to get a better deal from a new dealership? Or will the same dealership be obliged to provide the best deal? Looking for 12 or 15k miles/year. What would be the best MF / Residual I can expect in New York City/Long Island? Is it possible for a 350-400/month payment w/ 0 down? Taxes rolled into payments and just DMV fees up front. .00070 and 54% for 36/15. Add 2% for 12K. $2000 lease cash. $500 loyalty or conquest cash. Can't help you with projected payments without knowing the MSRP and adjusted capitalized cost. I would suggest reaching out to multiple dealers and get them to compete against one another. no money down dealer said $489 is that correct?? Okay so I have an offer from the dealer for '16 TLX w/ Advance pkg FWD. what do you guys think? Adjusted MSRP 39035 for 12k miles per year. 868.84 down includes 1st month and other fees. 445/month. 24371.20 purchase option. This is after 2250 cap reduction for loyalty and bonus. What is the MSRP and what is the adjusted CAP cost? The actual MSRP is 42320. The cap reduction is 2250. The salesman said that the Adjusted MSRP is 39035. I'm heading to another dealership on Saturday to see if they can beat it. But when I spoke with 2 other dealerships, they informed me that it was an aggressive offer. Hard to believe them since they are all employed by Acura in the end. Just to get your terms correct. There is no "Adjusted MSRP"
Total base payment: $16,020 / 36 months = $445 per month. Scale from 1 - 10, 1 being horrible and 10 being unbelievable. I appreciate the feedback from the experts. 1) What is the MSRP? 2) Is this the 4-cylinder or 6-cylinder? 1) What is the MSRP? 2) Is this the 4-cylinder or 6-cylinder? I get $445/mo, as well. Is this NY? If so, if the gross CAP includes sales tax, this looks like a pretty good deal. I get $445/mo, as well. Is this NY? If so, if the gross CAP includes sales tax, this looks like a pretty good deal. Yes, NY. In actuality it all came down to $610 down and $445/month for 35 months. $24,382.40 is my buy option at the end of the lease. Can I get residual and money factor numbers for 2016 TLX 4cyl base and TLX 4 cyl Tech package with 36 months and 10k miles per year in Ohio. The base has $1000 lease incentive, I believe. Is the Tech package lease cash at $1000 or $2000? .00070 and 59% (base) or 57% (tech). If I add the tax plus the $595 acquisition fee to the selling price, I get $422/mo., as well. I really don't. 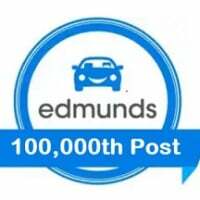 You can use the Make/Model/Year tabs at the top of the page to "build" your car and check Edmunds TMV.